Today, I'm sharing an evocative, heartbreaking extract from Firsts by Jane Mitchell, one of the writers shortlisted for the BBC Young Writers' Award 2018. I believed we were going to die. The storm was getting worse, as were the screams. The screams of the ocean. The screams of the people. Beating against my skull like the waves against the wood of the boat. Reaching out, I clutched my thin little girl close, the boat moaning threateningly as if it disapproved of the intimate gesture. Please God, help us, I thought. This wasn’t fair, not for her, my little one. Her three years of life on this earth had not yet provided her the joys of being alive, only grief and tears. There was so much I wanted for her, so many possibilities: her first day of school, her first kiss, her wedding. But she’d never get that now; we’d left one war only to be thrust into another. Was God truly this cruel? As if provoked, a profound screech grated against my ears as a large rusty pole collapsed onto the deck. A man screamed. I froze, a vile liquid swelling up my throat as I watched blood ooze down the man’s cheek in large clumps. I’m going to be sick, I thought, as I swept my daughter behind me and violently hurled over the edge of the boat. The dark waves mocked me below. Shaking, I turned and stumbled over to the old man with the bloody face, the mass of people around me clutching their loved ones, others clutching anything on this broken ship that resembled stability. I still held onto my little one. Jane Mitchell is 16 years old and is from Dorset. Firsts is beautifully structured story of displacement told through the voice of a mother battling to escape the country of her birth to find a life of hope for her daughter; Firsts shows the desperation of the refugee and the prejudice that comes as a price of freedom. This is the fourth year of the BBC Young Writers’ Award which invites all 14 – 18 year olds living in the United Kingdom to submit short stories of up to 1,000 words. The Award was launched as part of the tenth anniversary celebrations for the BBC National Short Story Award and aims to inspire and encourage the next generation of writers. The five shortlisted writers will attend the exclusive BBC Short Story Awards ceremony on 2 October 2018 at Cambridge University, when the winner will be announced live on BBC Radio 4’s Front Row and they will have the chance to meet high-profile authors, publishers, agents and broadcasters at the award ceremony. The winning story will be available on the Radio 1 website after the award ceremony on Tuesday 2 October, and will be available to download on the Life Hacks podcast from Sunday 7 October at 6pm. The winner will also receive a personalised mentoring session with an author to enhance their writing skills. I'm thrilled to be an ambassador for the 2018 Young Writers' Award and to reveal the talented shortlist of writers. The winner will be announced on Tuesday 2nd October and you can listen to the stories on the BBC website. ‘Sophisticated’, ‘mature’ and ‘awe-inspiring’: just some of the words used to describe the diverse and powerful stories that make up the shortlist for the 2018 BBC Young Writers’ Award with First Story and Cambridge University announced on BBC Radio 1’s Life Hacks show today (Sunday 23 September). The five stories, inspired by a desire for socio-political change or personal experience of mental illness, were written by young writers aged 15 to 18 years old, with each showing a maturity of language and ideas far beyond their years. Whether it be the brutal life of a unwilling young poacher; the desperation and prejudice faced by a mother fighting to give her daughter a better life; the experience of loss seen through a child’s eyes; the guilt of unspoken words as a family struggle to cope with mental illness or the pain of a young girl watching her sister in the grip of anorexia – the finalists have given powerful insight into the issues facing and motivating young people today and the importance of writing as expression. The stories, all under 1000 words, were praised by the judges for the poetic beauty of the writing and the imaginative power of the storytelling. Open to 14 to 18 year olds, the Award attracted 962 entries (a 67% increase from 2017). · ‘Under a Deep Blue Sky’ by Davina Bacon, 17, from Cambridgeshire. Inspired by Davina’s early childhood in Africa and her passion for environmental issues, this is the raw and emotionally powerful story of a young poacher and the brutal murder of a mother and baby elephant. Beautifully structured, parallels are drawn between the boy’s memory of his own mother’s death and the harsh realities of life where killing is his only survival option. · ‘Footprints in the Far Field’ by Reyah Martin, 18, from Glasgow. The pain of losing a baby is explored from the perspective of the child left behind in this evocative and moving portrayal of a mother’s all-consuming grief. An evocative and profoundly moving story. · ‘Unspoken’ by Lottie Mills, 16, from Hertfordshire. Unspoken explores the fragility of teenage mental health through the eyes of a girl watching her sister crying out for help while her family are in denial. A moving and powerful story that shows the isolation of those suffering and the vulnerability and helplessness of those watching from the outside. · ‘Firsts’ by Jane Mitchell, 16, from Dorset. A beautifully structured story of displacement told through the voice of a mother battling to escape the country of her birth to find a life of hope for her daughter; Firsts shows the desperation of the refugee and the prejudice that comes as a price of freedom. · ‘Oh Sister, Invisible’ by Tabitha Rubens, 16, from Islington, London. Oh Sister, Invisible is a poetic story of helplessness as a sister watches her sibling disappear with each passing season as anorexia takes hold. A story of grief, and of courage, it is intensely personal and conveys the unique power of writing to convey empathy and experience. 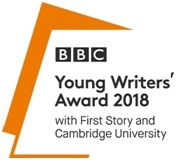 2 October 2018 at Cambridge University, when the winner will be announced live on BBC Radio 4’s Front Row and they will have the chance to meet high-profile authors, publishers, agents and broadcasters at the award ceremony. All five shortlisted writers will be given a private tour of ‘Virginia Woolf: An exhibition inspired by her writings’ at the Fitzwilliam Museum in advance of it opening to the public, and then meet Young Writers’ Award judge and fifth laureate na nÓg (Ireland's laureate for children's literature) Sarah Crossan for a writing workshop in Cambridge University Library. They will also receive a copy of the 2018 BBC National Short Story Award with Cambridge University anthology. I'm halfway through the thrilling Small Spaces by Sarah Epstein so it's exciting to share a guest post from Sarah about what inspired her to write the book and how it came together. I started writing Small Spaces before I had any idea exactly what the format or genre was going to be. I only knew it would be for young adult readers and it might have a few suspenseful scenes. I’ve long been a fan of thrillers, particularly psychological thrillers, but was that where my mystery idea was headed? And, more importantly, did I have the writing chops to pull it off? The seed of this story was my fascination with children’s imaginary friends. When my kids were little and attending playgroup and kindergarten, I’d hear stories from mothers about how they’d overheard their child’s one-sided conversations in the bath, or how their child’s invisible friend had to have a place set at the dinner table. I’d always think, where do these imaginary friends come from? Are they tied to emotional issues, loneliness or just boredom? Are they coping mechanisms, a cry for attention, or even, as some suggest, a spiritual presence that a child’s mind is open enough to see? This got me thinking about how it might affect relationships with family and friends if a childhood imaginary friend reappeared many years later. I wanted to explore a story about a character who was desperate to win the trust of others when she isn’t even sure she trusts herself. I had a hook that interested me enough to want to explore it, and it wasn’t long before the title popped into my head as well. The idea of small spaces conjured up so many different meanings for me, and the challenge was getting it all down on the page with a taut plot and a protagonist that readers could get behind even if they weren’t sure whether to completely trust her. For me, great thrillers present intriguing questions and convincing red herrings, and the pacing needs to be very tight. Slow patches will encourage readers to put the book down, and that’s something no author wants! My aim was to give readers a lot of information so they could start forming their own theories, then throw in a twist or two in the hopes of turning those theories on their head. The non-linear narrative structure of Small Spaces developed when I realised a large number of flashbacks would be required to properly explain what happened in my protagonist’s past. But I didn’t want to tell all of those in the passive past-tense voice of Tash recollecting them. I felt this would dilute the tension and affect the pacing. Instead, I wrote these chapters in present tense using Tash’s childhood voice so readers can see how things played out in real-time through her eyes. I also introduced therapy session transcripts and newspaper articles written in a clinical tone to present other evidence that isn’t skewed by Tash’s point of view. I found the climax of the story the most challenging part to write. I wanted it to do so many things while at the same time be fast-paced and absolutely gripping. Endings are always tricky – they need to feel completely satisfying for the reader while tying up all the loose threads and illuminating the story’s themes. I never start writing a story until I know how the ending is going to play out; then my challenge is figuring out how I’m going to get my characters there. Would I write another psychological thriller? Absolutely! Crafting Small Spaces pushed me out of my comfort zone and gave me the opportunity to play with a different format of storytelling than what I’d done with previous manuscripts. There is simply nothing more satisfying than entertaining someone with words and worlds you have created. I can’t wait to do it all over again. Thank you so much Sarah! I love the structure of this book, so it's fascinating to get an insight into how it came about. I can't wait to see how Small Spaces ends and I'll be posting my review soon! I'm thrilled to reveal the cover of Dawn Kurtagich's latest book, which is due to be published in June 2019. Her previous books, The Creeper Man and The Dead House, are my favourite YA horror books because they have the perfect blend of excruciating suspense and the most deliciously disturbing horror. I couldn't be more excited about this book, and the gorgeous cover is so intriguing! 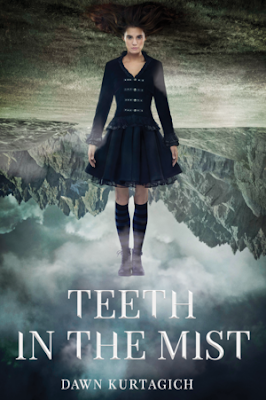 Teeth in the Mist is based on the legend of Faust and is described as being 'perfect for fans of Kendare Blake and Ransom Riggs'. Seventeen-year-old Zoey has been fascinated by the haunted, burnt-out ruins of Medwyn Mill House for as long as she can remember—so she and her best friend Poulton decide to explore the ruins. But are they really alone in the house? In 1851, sixteen-year-old Roan arrives at the Mill House as a ward—one of three, all with their own secrets. When Roan learns that she is connected to an ancient secret, she must escape the house before she is trapped forever. This haunting horror and captivating mystery redefines the horror and fantasy space. If you like the sound of this book as much as I do, you can add it to your Goodreads here. In the meantime, you should definitely check out Dawn's other books if you haven't done so already. They're perfect reads for autumn, Halloween, or any time you need a good scare.